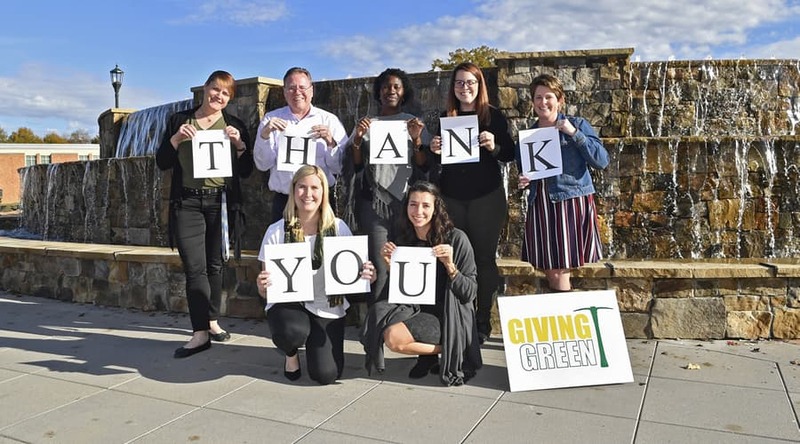 UNC Charlotte faculty and staff members answered the call again for this year’s annual Giving Green campaign. Contributions totaled $248,928, and the campaign reached a milestone of 1,010 unique faculty and staff donors. Giving Green is the unified, campus-wide campaign that generates financial support for the Arts & Science Council, the State Employees Combined Campaign and the UNC Charlotte Foundation. The campaign kicked off Sept. 26 and ended Oct. 31. UNC Charlotte also broke records this year with Niner Nation Gives, the 49-hour digital fundraising campaign that offered students, faculty, staff and friends of UNC Charlotte a chance to celebrate the University by making a gift to their favorite college or unit. The University raised $265,244, via 1,949 gifts from donors in 39 states and Washington, D.C. Niner Nation Gives also attracted 850 new donors this year. Notable funds that donors contributed to include the Charlotte 49ers Athletic Foundation, Jamil Niner Student Pantry and the UNC Charlotte Emergency Relief Fund, which will provide scholarships to students who were affected by the recent hurricanes. The University had a total of 334 employees who contributed to Niner Nation Gives; those donations also counted toward Giving Green. The Graduate School gave its employees an extra incentive to contribute to Niner Nation Gives: a quilt made by Claudia Reynolds, wife of Graduate School Dean Tom Reynolds. The quilt was raffled off for donors who supported the Graduate School during the 49-hour digital fundraising campaign. Reynolds named the quilt “49er Proud.” Ellie Feely, customer service manager in the Graduate School, won the quilt.